Pakistan's Supreme Court has overturned the conviction of a Christian woman sentenced to death by hanging for blasphemy against Islam. 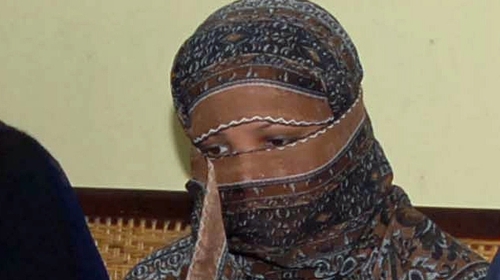 Asia Bibi, a mother of four, has been living on death row since 2010 when she became the first woman to be sentenced to death under Pakistan's harsh blasphemy laws. Ms Bibi has always denied blaspheming. Her case has outraged Christians worldwide and been a source of division within Pakistan, where two politicians who sought to help Ms Bibi were assassinated. "The conviction is set aside. She is acquitted of all charges and if not required for any other charges she will be released forthwith," said Chief Justice Saqib Nasir, who headed a special three-person bench set up for the appeal. A hard-line Islamist party in Pakistan called for the Chief Justice's death following the ruling. The leader of the Tehreek-e-Labaik (TLP) party also called for the removal of Prime Minister Imran Khan's government over the case. In November last year, TLP staged a crippling blockade of the capital after small changes to a religious oath, which it claims was tantamount to blasphemy. Seven people were killed and more than 200 wounded in clashes with the police, and TLP's supporters only dispersed after striking a deal with the military. Insulting Islam's prophet is punishable by death under Pakistani law, and blasphemy accusations stir such emotions that they are almost impossible to defend against. Dozens have been killed following blasphemy claims, sometimes by mobs of men. The law does not define blasphemy and evidence might not be reproduced in court for fear of committing a fresh offence. Ms Bibi's representatives have claimed she was involved in a dispute with her neighbours and that her accusers had contradicted themselves. In February, Ms Bibi's husband Ashiq Masih and one of her daughters met Pope Francis shortly before Rome's Colosseum was lit in red one evening in solidarity with persecuted Christians.